Notejoy is an easy and powerful collaboration tool that can be used to capture & share just about anything with your team. But what makes Notejoy shine is that it's far easier to capture and share notes compared to traditional tools, resulting in teams sharing well beyond what they traditionally shared in docs & wikis. Here are thirteen such ways teams today are using Notejoy to capture & share more with their team. Capturing meeting notes was one of the original uses we envisioned for Notejoy. We were constantly frustrated with the fact that we'd see folks taking personal notes during a meeting, yet no one actually sent out any meeting notes. We found that people preferred the productivity of personal note taking tools and while they could technically share notes with Google Docs, it was far too much effort to be worth it. 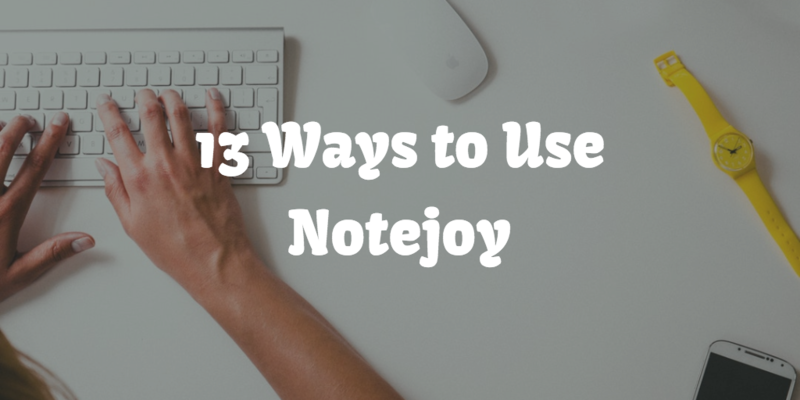 Now with Notejoy, you get the productivity of a personal note taking tool with effortless sharing. Just create a team library with your entire team and any notes you create in there are automatically shared with the team. You can even @mention meeting attendees in the comments to bring the note to their attention. For recurring meetings you might create a specific notebook, pin a note that you'll use as a meeting note template, and then duplicate that note each time you meet. This makes it super fast to get going with capturing discussions and action items from meetings in a consistent way. In many companies managers have periodic 1:1 meetings with their direct reports to create dedicated time for employees to learn from and get feedback from their manager. The best managers let their direct reports also drive the agenda. Notejoy becomes a great tool for keeping tracking of shared 1:1 agenda items that can be added at any point by both manager or direct report. Folks often create a team library that they share with just that direct report, ie. "Bob / Kyle". Then either have one note that they keep adding to each week or create a new note for each week's 1:1 meeting. Many companies adopt a goal-setting framework like OKRs (objectives & key results) to help drive alignment across their entire organization as well as transparency on the top priorities across the company. The challenge is these are often lost in slides that aren't very easy to access, resulting in them initially set and forgotten throughout the quarter. With Notejoy, you can make your OKRs or other goal format easily accessible to everyone in the entire company. One way to do this is create an OKR team library. Then create a notebook for each quarter or other timeframe that you set OKRs. Then pin an OKR template note to the top of the notebook. And then have each individual duplicate the note to create an OKR note for their own team or themselves. You can take advantage of our red, green, and yellow highlight colors to easily score OKRs as well. And you can even circulate drafts to get feedback from others before finalizing. Customer success teams have become a crucial component of any B2B business looking to drive retention and growth across their customer base. While sales has sophisticated tools like CRM for tracking their regular activity, oftentimes CRM is overkill for customer success teams. We've had many customer success teams use Notejoy as a light-weight way for them to keep track of conversations with customers, follow-ups and action items, as well as simply to keep the internal team on the same page. Often they create a customer success library and a notebook for each customer. They then capture onboarding notes, meeting notes, and more in the notebook. Some even create a team library that they share with the customer directly so they can share resources, collaborative on follow-ups, and more. While product teams often share the results of customer interviews with their team in summary reports, teams who have adopted Notejoy for customer research love using Notejoy for both sharing the final summary report, but also the raw notes from each interview. Since it's easy to create a notebook to capture all the raw notes and then pin the summary to the top of a notebook, it's a great way to allow anyone in the organization to simply get the highlights of the research or dive deep into customer interview notes themselves. This is often helpful for others to be able to hear the voice of the customer directly from the notes or for others to be able to synthesize their own conclusions from customer interviews. This makes the customer research become so much more valuable beyond the initial scope of the research. Teams are often eager to enable anyone within the organization to be able to come up with their own insights based on their business data, but doing so often requires becoming familiar and versed in SQL queries. The SQL skillset throughout an organization often various significantly. Teams have found Notejoy to be a great place to capture SQL queries and what they do and share them throughout their organization as a way to help each other learn how to derive valuable business insights from their company's data. Teams often use A/B testing to test new variants of landing pages, feature re-designs, and more to help optimize their product experience. But they often poorly share the results of A/B tests broadly with the team. Most often they get sent out in emails that are only immediately useful to those on the TO or CC line. Teams are now documenting A/B test results in Notejoy, because it's as easy as sending an email, but are broadly available to everyone in the organization, allowing teams down the line to be able to quickly reference test results to decide whether a similar test might make sense for their own product area. Teams have started to share All hands presentations as a document attachment inside a note in an All hands team library to make it very easy for employees to quickly find and catch up any presentations they missed, or reference content from them in the future. They find this to be a far easier way to find All hands than hunting through Google Slides, Dropbox folders. Teams have started to share their best practice email templates for sales, customer success, customer service, and client engagement inside of Notejoy. It becomes a super quick tool to allow you to draft emails, copy/paste them into your email app, and go. For example, a real estate brokerage stores all email templates for the entire lifecycle of a client's engagement inside of Notejoy, after developing these emails over the years. This allows new agents to quickly leverage the best practices across the brokerage through a rich repository of email templates. The best organizations take the time to document and communicate important decisions made within their organization. This helps create alignment across the organization, helps others understand the rationale behind a decision, and helps to clarify vision and priorities for a company. Notejoy is a super quick and easy way to share decisions with the team that has much stronger longevity than simply relying on an email alias for sharing decisions, since you can always come back to them and even search for them when trying to understand rationale, revisit decisions, or make similar decisions in the future. Companies quickly develop their own jargon, abbreviations, or code names that they use throughout the organization. This becomes a nightmare for new employees to get up-to-speed on what all these proprietary terms mean. Notejoy is a great place to store a company glossary containing definitions for all these terms with super fast search to quickly retrieve it when you are looking for it. While wikis are often the default tool used to share HR policies, folks often find Notejoy to be a far more flexible tool for capturing and sharing policies with the entire company, since it allows you to quickly add new content, allows users to leave questions & comments that others can benefit from, and robust search to allow people to find the exact HR information they are most interested in. New employee onboarding guides are great to store in Notejoy. Managers can easily duplicate a generic onboarding guide that the HR team puts together and then customize it for their specific team. Individuals can also duplicate onboarding guides so they can manually check off items so they can manager their own progress against their various action items. It's also very easy to link to various notes in Notejoy from an onboarding guide, helping a new employee get quickly up-to-speed on all critical resources and information within the organization. Hopefully this gives you a few new ideas of how best to take advantage of Notejoy within your own organization.